I absolutely love the new Liquid Sand trend in nail polish, but since I don’t own those polishes and don’t want to spend the money, I’ve been searching for a way to achieve the matte, textured look with the polishes I already own. I may or may not have missed the mark exactly on a Liquid Sand look with this technique, but I think the manicure that came out of it looks pretty cool! 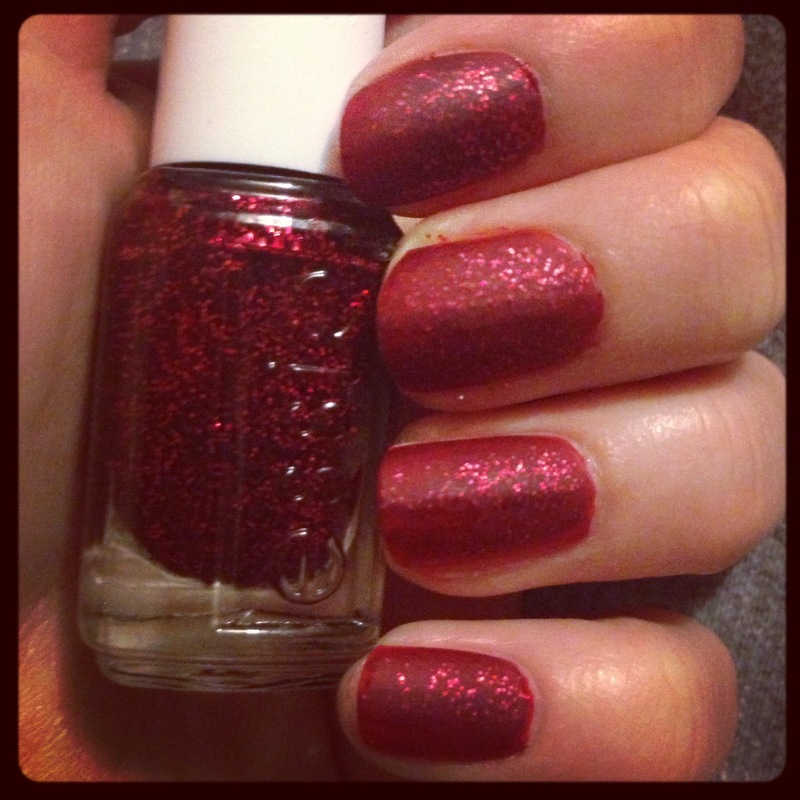 I love the look of the glitter with a matte topcoat – it stands out and sparkles without actually being … glittery. I’m a big fan of the way it came out and I can’t wait to test the look again on different colors and glitters soon! To get this look, I started with clean nails and a coat of Seche Natural. I love Seche Natural because it really creates a smooth canvas for you to start your manicure on. I used Essie’s Winter Collection polishes to get this look. I started with an opaque, non-glitter red shade to go underneath my red glitter because a lot of glitters aren’t totally opaque. I didn’t want my nails to show through. Adding a solid polish underneath a glitter polish of the same color will create the illusion that your glitter is opaque. Begin with one or two coats of Essie’s Snap Happy – just enough to coat your nails evenly. The glitter I used has a bit of a tint to the base, making it a “jelly” polish. It’s definitely not a clear base, and it’s definitely not an opaque polish – but it has a deep red tint to it. 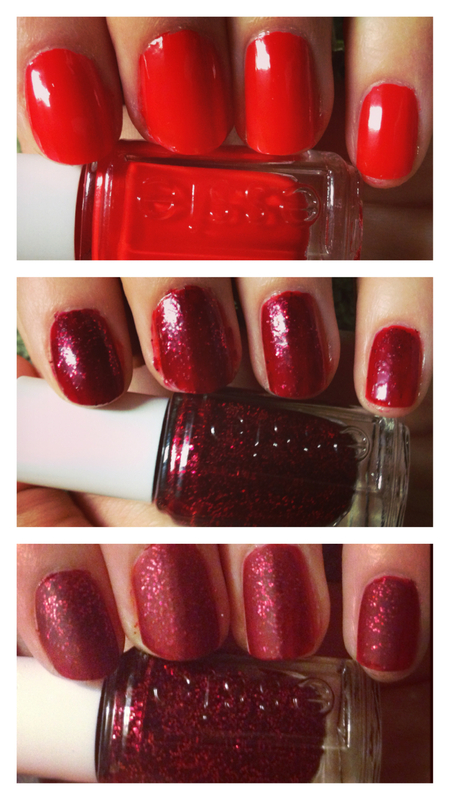 I used Essie’s Leading Lady for my glitter. Since the reds aren’t exactly the same, I created a cool new color by blending the regular red polish with the jelly glitter. However, since they are slightly different, you’ll want to be sure to cover your nails totally so that one color doesn’t peak out underneath the other. To add the mattifying effect, I used NYC’s Matte Me Crazy Mattifying Top Coat. In my opinion, this is a way better option than investing money in actual matte polishes because this one bottle can turn any manicure into a matte manicure. Swipe on one even layer of this top coat and you’re good to go. Seche Vite or any other top coat need not apply, as Matte Me Crazy is a top coat in itself.